Last week, I took some riders to a show. It was a mixed bag: some good, some not-so-good. There were no blue ribbons, although there were some good placings in competitive classes. With those, however, were a fall, some refusals, and some rough rounds. One rider brought her “evergreen” horse to his first rated show in over a year. He jumped amazingly well, but wasn’t easy to get going around the entire ring. The rider was disappointed. She had hoped to be rewarded for the countless hours she has spent at home, working to build her horse’s confidence. Some of their jumping rounds were quite good, getting the attention of several people on the rail, who acknowledged his wonderful jumping efforts. But he still looked green. At first, this rider was upset for not having the rounds she’d have liked. There are not many riders who have worked as hard as she on a horse that’s been as much of a challenge. I wanted to save the day for her, to help her understand that the show hadn’t been a waste. There were GREAT THINGS happening, the most important of which was this: she gave it everything she had. There was no stone left unturned, no late or unfair decisions. Nothing was last-second. Every class had a plan and in each one she worked on different issues. Did he respond as perfectly has she’d wished? No, but that’s horses. Sometimes they have different ideas. She rode well. She saw all her distances to the jumps. If an adjustment didn’t work well in one class, she was able to adjust her plan for the next course. These were THINKING rides. I certainly wasn’t disappointed, and I wanted her to realize that she didn’t have to be, either. I think I saw a look of understanding on her face as we finished our post-class debriefing. I certainly hope she felt pride in her efforts. 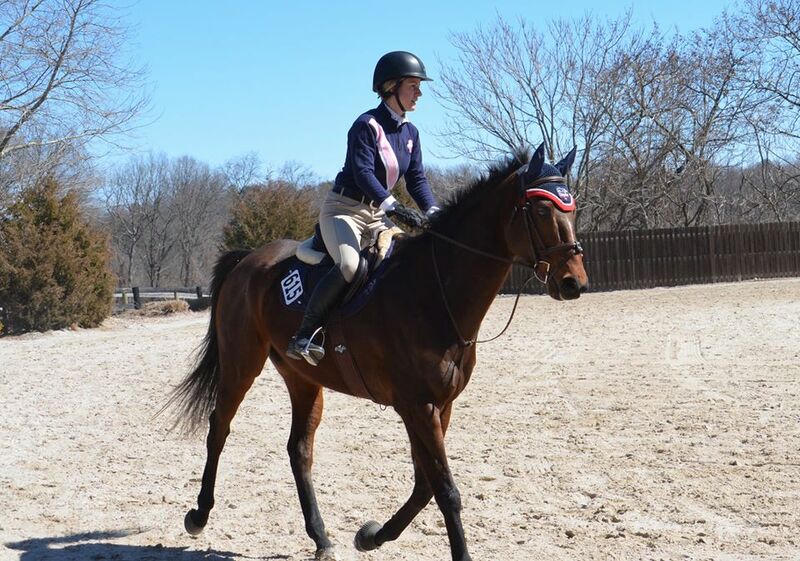 For another rider, her first class ended at the first jump. A couple of things went wrong on the way to it, and she wasn’t able to get her lazy and still-green horse’s pace established in time. They had an unfortunate parting of ways. No one was hurt, and we quickly got her back on and back into the schooling ring. After a few more jumps, they were ready to try again. And it was work. This is a horse with spectacular form, but a sensitive soul who needs to know that his rider will help and root for him. And help she did. She encouraged and cajoled him, and he got it! She ended up with a well-earned third place in the final class. Was it easy? No way. But my greatest hope is that she learned that perseverance matters. With our help from the ground, she fixed it herself. What a mountain to climb; and what a thrill to reach the peak! One of our riders enters the jumper ring at last week’s show. I’m a riding instructor, but really, our horse is the teacher. There are situations I can’t reproduce at home, in the comfort of our own ring, over our own jumps. That’s why I love showing as a way to continue learning – to expand on the lessons. As I drove home from the show, I pondered the experiences for each of my riders. I always spend time thinking about changes that can be made to lesson plans, or horse’s training programs, or whatever else that can help improve a horse or rider’s performance. I go through the riders’ outcomes, and what my message was to each, to make sure they know what they did well, and what they need to work on. I also consider each rider’s day as a whole: Did they learn? Was the effort worth it? Did I help them to know that progress was made, in spite of not hearing their name associated with a ribbon over the loudspeaker? The greatest role we riding coaches have is helping students build life skills: grace under pressure, problem solving, tenacity, inner strength.The list goes on. Think of how many other areas of life those things can be applied to: school, career, relationships… I hope riding is a life-long endeavor for all of them, but even if it isn’t, the lessons from showing will live on in their daily lives. The ribbons are great, when you win them, but sometimes you leave the show grounds with things you can’t see. Great post!! Way too much focus on the outcome and the ribbons these days, and not enough on the process and the steps achieved along the way. Green horses are a challenge for any rider and the small steps forward along the path to maturity are to be savored and enjoyed. Thanks for focusing on those and not the ribbons.